In the last chapter quartz research in Ireland was outlined. In this chapter, attention will be turned elsewhere, picking up on some key themes in approaches to quartz research in various parts of the world. The decision of what to include in this seemingly eclectic selection of worldwide research was based on accessibility to research, published in English, which specifically analysed quartz. From this literature search, it is clear that despite quartz often being the predominant raw material in the respective regions, quartz research has been neglected. Section 4.2 discusses classificatory frameworks utilised by researchers, beginning in Section 4.2.1 with classifications of the types of quartz utilised in prehistory. The quartz available in a given landscape varies widely in terms of knapping suitability, and researchers have devised schemes in order to qualify these differences, with some suggesting that these differences meant that different types of ‘quartz’ would have been perceived as different materials by the users, and not seen in the petrological sense of mineral that we use today. Section 4.2.2 outlines various classificatory frameworks, such as attribute analysis and reduction sequences, devised for analysing the technological practices, using examples from America, Africa, and Scotland. Section 4.3 looks at researchers who have conducted experimental knapping and also use wear projects as well as an experiment on the identification of retouch conducted on quartz; these knapping experiments are based in regions where quartz was the dominant raw material for stone tools in prehistory, using examples from America, Sweden, Portugal, and Australia. Section 4.4 considers the symbolic and ‘non-utilitarian’ aspects of quartz that for the most part were not discussed by researchers in the previous sections, who focused on a more economic and technical view of technology. Research on the thermal alteration of quartz will be dealt with in Chapter 5. Section 4.5 concludes the chapter with an overview and discussion of the chapter’s topics. An important point concerning quartz lithic research is that the term quartz is a geological term for the mineral and therefore covers a very wide range of types of quartz available in a given area; these quartz types may vary significantly in terms of knapping quality. De Lombera Hermida (2009) noted that external aspects such as colour and opacity are redundant when attempting to characterise quartz from a mechanical perspective; from a petrological perspective quartz can be defined in two groups. The first is automorphic quartz which relates to what is considered in the archaeological literature as rock crystal. The second is xenomorphic quartz, which is “formed through the aggregation of several microcrystals, but macroscopically, has a solid structure” (de Lombera Hermida 2009, 7) – when discussing xenomorphic quartz, the terms ‘grain size’ and ‘crystal size’ are used interchangeably. Depending on the conditions in which quartz forms, and later tectonic activity, the crystals will form in different conditions and hence sizes, which creates the grain texture and internal flaws, with the latter defined as planes. Grainy quartz is xenomorphic while macrocrystalline (rock crystal) is automorphic, with the former sub-divided into fine- and coarse-grained. Plane relates to internal flaws or crystalline surfaces. He notes that four morphostructural groups of quartz can be distinguished based on the presence or absence of grain and plane: NN (no grain, no plane), NS (no grain, plane), SN (grainy, no plane), and SS (grainy, plane). In the Côa Valley, Portugal (Figure 4-1), a recently discovered Palaeolithic rock-art complex led to a systematic survey of the region, with over 30 Palaeolithic settlements recorded and various excavated dates ranging from 30,000 ± 2400 BP to 11,600 ± 1200 BP (Aubry et al. 2004, 2). The assemblages consisted of nearly 99% quartz or quartzite. Through petrographic characterisation of the lithic assemblages compared to primary and secondary geological sources, the authors aimed to reconstruct the exploitation territories of the communities (Aubry et al. 2004, 3). The petrographic characterisation was conducted by macroscopic attribution and by X-ray diffraction, Scanning Electron Microscopy, and Energy Dispersive X-ray analysis. From this analysis they suggested that the quartz used was local and available close to each site; they divided the archaeological quartz into three categories based on grain size, and noted that the geological samples displayed a wide variation of petrographic and knapping qualities, the “definition of limits between the three classes is often difficult and could be observed in the same vein” (Aubry et al. 2004, 4). The quartz crystal used could be found locally, but larger crystals possibly came from regional sources. Rankama et al. (2006) outlined current research in eastern Fennoscandia (Figure 4-1), a region comprising parts of Finland, Norway, Sweden, and Karelia, where quartz is the predominant raw material. They suggested that the use of the term quartz as an overall term for a variety of sub-types of quartz may not be appropriate way of describing assemblages – rather than a petrological division, the knapping quality of the material may have been how the prehistoric communities categorised the material, and different petrological materials with similar fracturing properties may have been perceived as the same material (see also Abbott et al. Forthcoming). Along these lines, two researchers have provided a breakdown of quartz types for their respective regions – Ballin(2008) for Scotland and Jones (Forthcoming) for the South Atlantic Slope in the U.S. Ballin (2008, 46-49) subdivided the Scottish quartz into categories based on colour and grain size, with the caveat that the categories are not absolute, but quartz can grade between the categories, blurring the distinctions (Table 4-1). Jones (Forthcoming) subdivided the quartz from the South Atlantic Slope in the U.S. Similarly to Ballin, Jones (Forthcoming, 23) noted that his categories were not absolute but graded amongst each other, and a single outcrop or even a hand sample may contain two distinct types (Table 4-2). While Ballin (2008, 46) comments that his division of quartz follows “geological attributes” his use of ‘massive’ in describing his ‘milky quartz’ does not equate with the geological meaning of ‘massive’ – which is shorthand for massive habit, meaning “an assemblage of anhedral, interlocking crystals” (Menuge 2007 pers. comm.). Rather, his interpretation of milky quartz, which was “the most widespread quartz form exploited in Scottish prehistory” is that it is massive, milky quartz , with ‘massive’ implying that it is “basically like glass and that you cannot see any grains whatsoever” (Ballin 2007 pers. comm., emphasis in original). Jones (Forthcoming) subdivided the quartz in his area based on opacity and fracture surface texture, and partially on grain size, commenting that opacity is the least important and used only to distinguish two types from the rest. The processualist movement in archaeology called for a greater degree of quantification in lithic studies in order to present the research on a more rigorous scientific base (see Lyman and O’Brien 2004). This call led to many researchers moving away from analyses based on formal typological characteristics of lithics, and to examinations of the tools and debitage products’ technological characteristics; these were to be analysed as part of a technological package in order to develop models of prehistoric societal behaviour, and this emphasis on technology as opposed to typology occurred along with an increase of knapping experimentation and the study of fracture mechanics. Yet even though quartz was the predominant raw material in various parts of the world these studies were not in general carried out on quartz assemblages, because quartz was perceived to be an intractable material to analyse; the apparent irregularity to quartz’s fracture pattern made such studies as attribute analysis and reduction sequences inefficient, or futile, in terms of the results. Therefore, quartz assemblages, and quartz regions, lagged behind in such studies. In 1981 the first American – and worldwide – anthology on quartz lithic research was published, consisting of papers from various researchers based in New England (Figure 4-2), where quartz lithics are often predominant on most excavated sites; the papers represented the first tentative steps to in-depth quartz analyses (Barber 1981b). 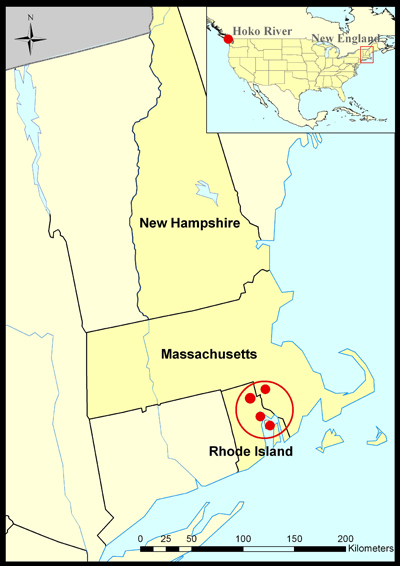 The majority of the papers dealt with assemblages from development-led excavations from a small area around the southeast of New England, with three of these examining reduction sequences and attribute analysis – Barber (1981a), Ritchie (1981), and Luedtke (1981). Since this 1981 anthology, however, there is a lacuna in published work on quartz in the region. Barber (1981a) excavated a Late Archaic quarry-workshop, which produced an assemblage of 99.4% ‘debitage’, and analysed the assemblage in order to assess the activities that had taken place there. He argued that a classification scheme based on chert was not directly applicable to the “peculiarities” of quartz, therefore he used four types for describing flakes: flat flakes, block flakes, bifacial thinning flakes, and pressure/shatter flakes. He analysed the debitage in terms of the reduction sequence of the tool manufacture. From this sequence, he suggested that this site was “merely a quarry-workshop” devoted exclusively to producing Squibnocket triangle points (the type experimented with by Boudreau in the same volume, see below pp. 65-6), and no other activity took place there (Barber 1981a, 62). Ritchie’s (1981) reduction sequence analysis was formulated in order to assess the contemporaneity between the Small stem point tradition and the Susquehanna tradition, and to define the variables in the possible reduction sequences. He commented on the limitations of using formal attributes: a number of “technologies or production techniques” may produce similar forms; consequently, the investigation of “constructional units” such as direction of flaking, flake scar length, orientation of flake blank to fracture planes was built in to the attribute analysis – these would be used to understand the knapper’s set of decisions (Ritchie 1981, 101). The assemblages under scrutiny came from five dated contexts from two nearby sites. Ritchie (1981, 114) noted alternative reduction sequences in the material, suggesting that this was caused by the different types of quartz used, and commented that some of the “technological” variation noted needed more research in order to draw out the reasons behind them. Luedtke (1981) used attribute analysis in order to develop a system of debitage analysis that could be used to date assemblages without diagnostic artefacts or dateable material. One dated assemblage was compared to two undated assemblages. The attributes selected included some specifically chosen for quartz, including the flake orientation to the “visual grain”, which is apparent as streaks (Luedtke 1981, 64). Her attribute analysis broke down into variation due to: material type and constraints, production sequence stages, and cultural preferences. Luedtke (1981, 76) commented that the results of the study highlighted “the inherent complexities of debitage analysis”, and that much work was needed on the mechanical properties of quartz, the manufacturing sequences of quartz, and analyses of well-dated sites to assess cultural attributes. As with the examples from New England, in many parts of sub-Saharan Africa quartz was the dominant material for stone tools. 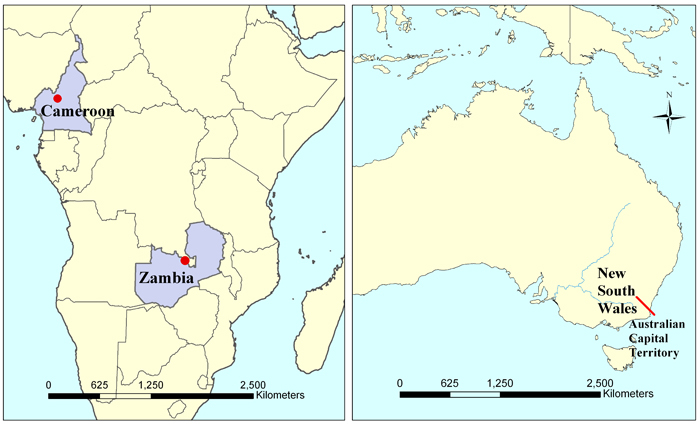 Excavations in Cameroon and Zambia led researchers to devise strategies to understand the reduction sequences of quartz-dominated assemblages where formal tools were for the most part lacking or difficult to discern. Cornelissen (2003) used a typotechnological approach for the analysis of a quartz-dominated assemblage – dating from the Lower Pleistocene to the Early Holocene and based primarily on a microlithic technology – from the Shum Laka rock shelter, Cameroon (Figure 4-3). In undertaking a typotechnological analysis, Cornelissen (2003, 11) noted that the first obstacle was in describing a quartz typology; he commented that previous researchers had either attempted to allow the material to create the classification, or ignored the quartz component of assemblages. The difficulties in classifying a quartz assemblage with an established non-quartz typology were because the “definition of tools and modified pieces remains difficult on quartz artifacts [sic] because intentional retouch can be lost in the irregular surface of the raw material”; conversely, these surface irregularities could be mistaken for retouch and other edge modification, “with consequent problems of over- or undertyping” (Cornelissen 2003, 13). In order, however, to avoid a localistic typology, he opted to use an established typology, “which uses the presence of intentional retouch to subdivide the assemblage into waste (90-95% of the assemblage), modified and retouched pieces, and shaped tools”; due to the difficulties of “recognizing [sic] intentional retouch on quartz artifacts [sic]”, ‘scrapers’ were not subdivided into sub-types but lumped as scrapers (Cornelissen 2003, 13). The assemblage was divided into ‘cores’, ‘flakes’, ‘tools’, ‘utilised’, ‘modified’, and ‘fragments and chunks’; quartz ‘fragments and chunks’ comprised between 89.8% and 98.1% of the assemblage by level – the categories of ‘utilised’ and ‘chunk’ were not defined (Cornelissen 2003, 12). Bipolar cores were absent throughout the periods, and no major shifts were noted in either the use of raw material or technology. Cornelissen (2003, 19) suggested that quartz was not used simply because of resource availability, as other raw materials were available locally, but were not used extensively; rather, quartz was purposively chosen as it was suitable for microlithic production. Bisson (1990) analysed the reduction sequences of a quartz assemblage from a Late Stone Age rock shelter in Luano Spring, Zambia (Figure 4-3), where over 30,000 lithics were uncovered. As noted in the opening quote to this thesis, Bisson (1990, 103) commented that “there are few things more discouraging for an archaeologist interested in the study of lithic reduction sequences than to be faced with the analysis of an assemblage that is made on poor quality quartz”, and consequently, that researchers had neglected the quantification of quartz assemblages and the analysis of the reduction sequences. The principal aim of the study was to assess any changes in the reduction sequences of the assemblage over time, as the traditional understanding of the change of frequency in formal types as representing cultural change did not seem to apply. In reconstructing the reduction sequences – through attribute analysis – Bisson commented that formal tools (microliths) comprised only 0.0048% of the assemblage, and bipolar cores were rare throughout the levels. The analysis did not examine the “angular fragments” and broken flakes, but only the complete flakes and cores. The end results suggested that the assemblage represented one technological tradition and that the change in formal tool frequency could be explained by activity facies; some differences in formal tool types between the Luano Spring assemblage and others were suggested as being due to differing raw material. Bisson (1990, 128-9) noted that the analysis did not “add much to the information gained from the analysis of formal elements”, but the analysis aided the establishment of a techno-chronology for other assemblages in the area. Saville and Ballin initiated a research programme based on Scottish quartz lithics which aimed to “increase awareness of the significance of quartz throughout Scottish prehistory” (Ballin 2008, 2). Ballin (2008, 2) noted that “many publications of Scottish quartz assemblages, as well as quartz reports world-wide, tend to be characterized [sic] by lack of enthusiasm, detail and precision”. 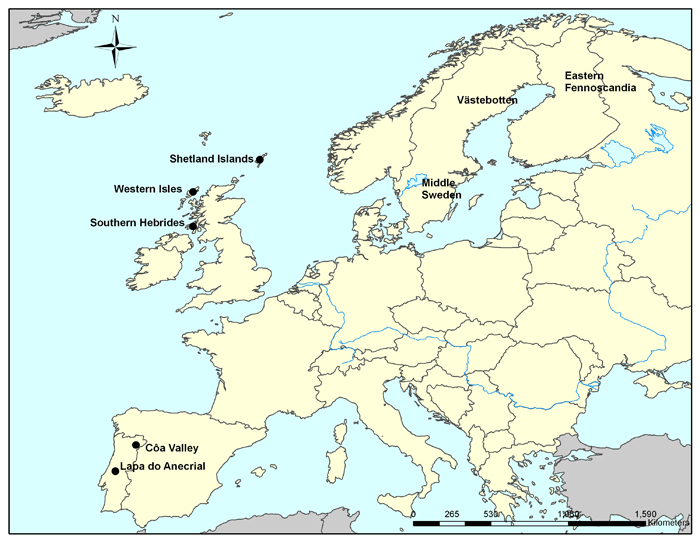 This was despite the fact that quartz use was widespread in Scotland, and dominated assemblages in the Shetlands, the Western Isles, and the Southern Hebrides and west mainland Scotland, as well as appearing as minor parts of assemblages from other areas (Figure 4-1). The project examined 16 assemblages ranging from Palaeolithic to Iron Age as well as a quartz quarry; these assemblages were both reassessments of older assemblages and analyses of recently excavated assemblages. The project focused on examining typology, technology, inter- and intra-site spatial patterns, chronology, and variability of the raw material (Ballin 2008, 2-3). "One of the main questions discussed by the 1980’s Scandinavian analysts was whether quartz artefacts should be classified according to the same type schema as, for example, worked flint. As a response to the difficulties experienced in the classification of quartz assemblages, lithics specialist [sic] working in Scandinavia favoured a separate quartz typology…The present author disagrees strongly with this approach, as its logical consequence is that assemblages in flint/flint-like silica and quartz cannot be compared directly…A separate quartz typology is still very much favoured in parts of Scandinavia, where Knutsson argues that the difficulties of quartz analysis is [sic] largely a product of the automatic use of an ill-fitting flint artefact typology...However, his examples …clearly demonstrate that the main problem is a prevailing tendency amongst Scandinavian analysts to classify quartz chunks and fragments as tools if they have the slightest formal likeness to traditional lithic tool types…This problem could be dealt with simply by adhering to a simple rule: that a quartz artefact is not a tool unless it has the distinctive retouch generally associated with a particular tool type…Lindgren demonstrates experimentally, and by blind-tests, how difficult it can be to recognise modification on quartz artefacts...and it is a fact that many quartz assemblages seem to either lack quartz tools or have very low tool ratios. However, it is, in the author’s view, an illusion that classification of quartz tools (i.e., the recognition of retouch) would become any easier with a different typology" (Ballin 2008, 40 emphasis added). 1. They are more difficult to recognise than tools in most other lithic raw materials. 2. “Quartz blanks were frequently usable as tools, without further modification”. 3. “Most quartzes tend to flake in more irregular ways than other silica”. 4. “Economical differences between some quartz-dominated and some flint-dominated assemblages”. 5. “Visually distinctive raw materials were frequently associated with non-functional, or symbolic, values” (Ballin 2008, 73). An unusual feature of Ballin’s analysis of the selected assemblages is that, while he mentions the fragmentation of quartz in the quote above, the fragmentation characteristics of quartz were completely ignored in his work and no differentiation was made between complete and fragmented flakes. Indeed, the only mention of fragments are where a number of core fragments are noted. It is unclear as to why the flakes are not designated as complete or fragments, and are presented as if they are all complete. In the last section it was noted that the emphasis in the processualist movement in archaeology on technology as opposed to typology occurred along with an increase of knapping experimentation and the study of fracture mechanics. While research concerning quartz lagged behind cryptocrystalline materials, a number of researchers from around the globe did devise quartz knapping experiments in order to interpret the archaeological record. In an anthology arising from a 1974 Australian conference Dickson (1977) reported on his experimental work on quartz, which was based on excavated material from four sites in New South Wales and the Australian Capital Territory (Figure 4-3) – this paper is one of the first worldwide to explicitly deal with experimental quartz-knapping. Commenting on a debate that was recurrent at the time, he argued that bipolar cores were “residuals” and not implements in their own right (Dickson 1977, 97), as was also argued by Flenniken (see below p. 67). Dickson’s (1977, 98) experimental work involved knapping quartz in various ways, including direct and indirect percussion, and led him to the conclusion that the bipolar technique “is the only way to reduce a lump of quartz”. In the 1981 New England anthology mentioned above, Boudreau (1981) outlined his replication of bifacial Squibnocket triangle points and Squibnocket stemmed points based on comparisons of his surface collections of lithics. Following the American tradition, the words ‘debris’ and ‘debitage’ are used interchangeably to mean the waste material produced during tool manufacture; his debris types fell into five broad categories: shatter, flake and flake-like types, exhausted cores, artefacts broken during manufacture, and unbroken, incomplete points and rejects. He suggested that both a combination of percussion and pressure flaking, as well as pressure flaking alone could produce the points he was replicating, with the latter technique producing thicker points than the former (Boudreau 1981, 6). Boudreau commented that his experimental knapping was for the most part uncontrolled, and geared towards showing possible methods of manufacture, and that no formal analysis of the experimental material had been conducted at that stage. In 1983, Baker (1983) published a paper, originally presented at a conference in 1976, on experimental knapping of vein quartz from Putnam County, Georgia (Figure 4-2) Previously, an excavated assemblage from around this area had been labelled the ‘Old Quartz Industry’, and the experimental work sought to understand how this assemblage related to the “numerous surface sites in the Georgia and South Carolina piedmont which yielded only quartz artifacts [sic]” (Baker 1983, 5). Baker (1983, 7) described the quartz as a “granular milky quartz which was fairly homogenous although some impurities were present. Individual crystals in the stone were not observable without magnification; however, the crystals were sufficiently large to give the material a rough texture”. The experiments focused on the different attributes noted for hard (diorite) and soft (antler) impactors – 100 flakes for each impactor type were produced using hand held percussion, with the impactors being used on the same nodule in alternate turns. No quantitative attributes of the resultant quartz flakes were recorded during the experiments; instead, the study focused on 14 “qualitative attributes”, including “the frequency and character of flake breakage during detachment, force fractures, point of impact characteristics, inner platform configuration, and flake curvature” – these six attributes were subsequently observed to be the most useful for discerning the different percussion techniques (Baker 1983). Using these attributes, 315 broken and unbroken excavated quartz flakes were analysed, and the results - described as a “partial success” – suggested that while the attributes observed in the experiments also occurred in the archaeological material, “the attributes observed may occur on flakes independent of the percussion technique involved” (Baker 1983, 15). Baker argued, however, that using these attributes in conjunction with others, could be useful for the analysis of quartz assemblages. By far the most common quartz type utilised worldwide in prehistory was vein quartz, but quartz crystal – or rock crystal – was also used. Reher and Frison (1991) outlined experimental work conducted on knapping quartz crystals in Wyoming, USA (Figure 4-2). The authors noted that their paper was not a detailed outline of their work, but conveyed “basic information” only. Their experiments with quartz crystal – sourced from the USA and Brazil – showed that quartz crystal is “less forgiving” than chert in terms of correct angle and force used when knapping, and it is less elastic; they argued that knapping the crystals to produce “usable implements” can be done with “standard knapping techniques” (Reher and Frison 1991, 379-83). In the northwest of America, Flenniken (1981) undertook a study of a quartz assemblage from the Hoko River (Figure 4-2), a coastal site dating to c. 500 BC. Here, he used a model of “replicative systems analysis” in order to investigate the assemblage’s reduction sequence and function of the tools; this system included examining the assemblage from raw material procurement through to eventual discard; his methodology included replicative knapping and hafting, heat treatment, experimental use and use-wear analysis. The tools from the site were called microliths, but these were not related to “Old World” microliths, rather, they were simply small pieces of unretouched stone (Flenniken 1981, 77). The water logged assemblage produced hafted ‘microliths’, and he commented that the hafted ‘microliths’ recovered were not “specifically diagnostic and would not be recognised as functional tools if they were recovered from archaeological contexts minus their wooden handles” (Flenniken 1981, 78). With the ability to identify hafted lithics and therefore the perceived tools, he was able to classify the assemblage into what he considered as: 1. functional microliths; 2. potentially functional microliths; or 3. non-functional microliths – these classifications were based on morphological comparison to the hafted examples, allowing for the fact that both slightly smaller and larger lithics would also have been functional; the hafted, unretouched ‘microliths’ averaged 10.5 mm in length (Flenniken 1981, 70). The replicative work undertaken by Flenniken (1981, 86, 93) showed that the ‘microliths’ were produced using the bipolar technique, and his experimental work suggested that these “piece esquillees” were in fact exhausted cores and not suitable as bone or wood wedges, as had been argued by various other researchers. Experimental use of the hafted ‘microliths’ suggested that they were not useful for basketry, cordage or wood working, but served as fish processing tools (Flenniken 1981, 19, 135-6). The use-wear analysis of the tools, however, was not successful – use-wear, assessed primarily using low power microscopy, was not identified on either the archaeological material, nor on the experimentally produced tools, with Flenniken (1981, 160) suggesting that the fish processing carried out left no marks due to the hardness of the vein quartz. [t]hese same knappers probably employed different lithic technologies, depending upon the availability of raw material at other locations during their seasonal round. Lithic artifacts [sic] on the Northwest Coast are not 'index fossils' of specific archaeological phases, traditions, or cultures as a whole, but are rather an adaption to available raw lithic materials at a particular location (Flenniken 1981, 18-9). While most of the experimental quartz knapping initiated in the 1970’s was based in America, Callahan (1987) – an American researcher – undertook a series of quartz knapping experiments in Sweden. Although the flint-based technology of southern Sweden was well understood, the non-flint-based technology from middle Sweden had not been investigated by lithic specialists and his project aimed to define the reduction systems in the middle Swedish Mesolithic and Neolithic (Callahan 1987). Four excavated assemblages from middle Sweden were examined (Figure 4-1), and material was then experimentally knapped to verify the archaeological artefacts’ reduction techniques (Callahan 1987, 15). Three techniques used on quartz were identified – bipolar, freehand, and platform on anvil; bipolar accounted for 42% of the material identified, and a bipolar technique was also carried out on platform cores after the latter failed to produce flakes, allowing for the “complete exhaustion of the core...Such a system is marvellously versatile” (Callahan 1987, 58, 61). Callahan (1987, 18) argued that the artefacts were made from the “best grades of quartz” (and other materials) – which were not widespread in the landscape, suggesting that “the original knappers had sought out the most favourable locations of specific raw materials and systematically exploited these resources”. In terms of a tool typology for all the raw materials he researched, Callahan (1987, 62) argued that flakes were used as both unretouched (identified by edge dulling) and retouched – for the retouched flakes “[r]etouch often seems haphazard and adapted to the specific task at hand rather than to formalized [sic] mental templates. In some cases the ‘type’ seems to have evolved from use rather than design”. Callahan (1987, 62-3) warned, however, that the apparent simplicity of this system of tool manufacture and usage does not necessarily correlate with crudeness in the prehistoric technical system; he argued that a bipolar technique “should be seen as simple, but not simplistic” and suggested that the flakes may have been part of a complex non-composite or composite hafting system – conversely he argued that “even if such complexity [in hafting] were not practised, does it follow that the overall system was less efficient for the needs at hand?”. Around the time that Callahan undertook his experimental knapping based on comparisons to assemblages from middle Sweden, Knutsson (1988a) analysed Neolithic quartz and flint assemblages from Västebotten, northern Sweden (Figure 4-1) in an area with no sources of flint, but an abundance of quartz. As with Callahan, Knutsson argued that an understanding of the technological attributes was imperative, which subsequently necessitated an understanding of the fracture mechanics of the raw material in question – analyses based on formal characteristics were unhelpful because the assumption that similar forms equalled similar production sequences was not necessarily the case, and formal typologies overlooked technological attributes (Knutsson 1988a, 12). The bipolar technique and two percussion techniques were used to knap quartz – direct percussion and direct percussion on anvil. From these techniques, Knutsson (1988a, 89) suggested that “[b]y-products of quartz reduction can assume several characteristic forms. These forms do not necessarily bear a close relationship to different reduction stages or strategies. On the contrary, they can occur at any time in the course of reduction irrespective of the applied method of reduction”. One frequently occurring type of by-product, a “conical piece”, was also produced during the rejuvenation of a bipolar core (see Section 6.4.2); 70-80% of all flakes produced during his experiments were produced fortuitously – each strike produced more than one flake, and platform core knapping also produced apparent bipolar flakes as well (Knutsson 1988a, 91-3). Knutsson’s (1988a, 94, 198) analysis of the excavated assemblage suggested that the raw material was procured from glacial cobbles, and in the first phase of occupation, the dominant technique was to begin the core with a platform-on-anvil technique, followed by a bipolar technique; the bipolar cores were then shaped into scrapers. The second period saw the arrival of flint-using communities, which used different techniques for manufacture; the third phase saw the adoption of the use of flint by the quartz using communities, who knapped in the flint in their traditional ‘quartz way’ – but while the “selection of usable flake edges” remained similar to the first period, their quartz knapping then excluded the final stage of bipolar knapping and, consequently, the use of scrapers made from bipolar cores. A fourth period has similar quartz flaking strategies to the previous period, but with the inclusion of bifacially flaked quartz points. Knutsson (1988a; 1988b) also undertook a use-wear analysis of the Västebotten assemblage. The use-wear analysis was conducted with low power and high power microscopy, and suggested that both retouched and unretouched flakes were used, and that the breakage of quartz either intentionally or during manufacture was used to the advantage of the communities – for example, flakes with breaks creating right angled edges were “systematically selected for use as planing tools” and broken pointed flakes were “selected for use as piercers and obtusely angled scraping or planning tools (Knutsson 1988a, 140). Discussing his recent research in Portugal, Almeida (2006, 78) noted that earlier excavations in Portugal were difficult to use in analyses because most of the non-flint materials were generally discarded, along with the smaller artefacts. Therefore quartz was under-acknowledged as a substantial component of the lithic traditions of the region, a fact which was now being realised based on recent excavations. Almeida (2000; 2007) undertook an analysis of a Portuguese Palaeolithic cave site Lapa do Anecrial (Figure 4-1). The analysis consisted of experimental knapping, refitting, attribute analysis, and use-wear. The cave site had three main layers dating from 24,000 BP to 20,000 BP. Almeida (2006, 80-4) noted two aspects to quartz use – firstly, there is an intensity of use during the Terminal Gravettian which diminishes in later periods; secondly, while in other periods quartz was used “as a second choice for expedient technologies related to flake production, in the Terminal Gravettian quartz was exploited through the same strategies that were applied to flint”, and the quartz used was not directly local, and the refitting of the assemblages pointed out that more quartz blanks were taken away from the site compared to the flint; Almeida argued that this use of quartz was “an example of the importance of group traditions affecting raw material choices: the strength of tradition may be manifested by a pronounced and recurring preference for a particular raw-material which cannot be explained by either technical or economic considerations”. The project had a high rate of success with refitting, accounting for 50% of the artefacts; by weight 92% were refitted meaning that only the small pieces were not. The refitting of the quartz and flint showed that the reduction strategies for the two raw materials were identical, and that this was attributed to the high quality quartz available; one distinction was that the flint had been de-cortified before being brought to the cave, and another was that the abandonment of quartz cores was due to hinging and natural cleavages, whereas abandonment of flint cores was due to their reduced size (Almeida 2007, 61-2). The refitting suggested, as mentioned above, that a larger proportion of the quartz bladelets produced were taken from the cave than those of flint. The use-wear and refitting also showed that two of the traditional ‘tool’ types, both scrapers, that were seen as typologically indicative of the Aurignacian V, were shown to have no use-wear but were in fact bladelet and flake cores (Almeida 2007). Nevertheless, while Thacker (2001, 11) has concurred with Almeida that the carinated scraper should be regarded as a core, he has also shown evidence for use-wear on them, suggesting that they acted as both cores and scraping tools. The previous examples of experimental work concerned experimental knapping in order to understand prehistoric technologies, while Lindgren’s (1998) experimental work was undertaken in order to understand how archaeologists identify retouch on quartz artefacts. Commenting on quartz research that focused on technological aspects – such as that of Flenniken (see above pp. 67-8) and Knutsson (see above pp. 69-70) that showed that unretouched quartz artefacts have evidence of use-wear and therefore qualify as ‘tools’ – Lindgren (1998, 97) has argued that while these “technological studies have been of great value…There may however be a danger in focusing exclusively on technology and leaving aside the question of formal tools”. (Lindgren’s use of the term ‘formal tool’ appears to apply to any retouched lithic, and not follow some researchers’ division of an expedient retouched tool and a formal retouched tool (cf. Andrefsky 1998, 213-8; Wenzel and Shelley 2001, 119); Tomka (2001, 209), however, also uses formal to imply any retouched piece.) Lindgren suggested that previous research in eastern central Sweden – where quartz predominates – had not focused on quartz tools as a source of information, and from a flintcentric viewpoint quartz was seen as not fitting into the usual form of tool, apart from the category of scraper, and formal types were treated with suspicion due to difficulties in identifying retouch on quartz. Therefore, there was no “chronological sequence, a typology, of the formal tools from this region” (Lindgren 1998, 97). Lindgren used a blind test on 13 of her colleagues in order to ascertain the level of retouch recognition, in a test in which they were not asked to specifically look out for retouch (this was done so that the participants would not try to find retouch in particular). The results showed that 59% of the retouch was identified, and also that 23% of the participants identified an unretouched flake fragment as a transverse arrowhead, as it had a similar form even though it lacked retouch. From this test, Lindgren (1998, 100) argued “that there is a risk of retouched objects not being classified as retouched. It also shows examples of how a familiar shape can lead the archaeologist into identifying formal tools”. The previous quartz research cited in this chapter primarily focused on lithic technology in one interpretation of technology (see Dobres 2000), and for the most part avoided discussions of quartz in terms of the spiritual, ritual, or symbolic spheres. These spheres cannot, of course, be easily divorced from the apparently ‘utilitarian’ sphere of stone tools, but almost all of the research noted in the previous sections was silent on these aspects of technological practices involving quartz: instead they retained a view of technology and technological practices which involved rational, economic, and technical motivations for quartz manufacture and use. However, as suggested by Almeida above in the context of the Portuguese assemblages, the preference for quartz by the communities there did not seem to be based on technical or economic reasons, but rather on what he described as group traditions. These group traditions suggest the placement of a value on the use of quartz which transcends the apparent gap between the spheres of the utilitarian and non-utilitarian. Although the use of quartz by the communities in the Portuguese example is not pinpointed as ritualised or symbolic, the example highlights that a more rounded view of material use is necessitated; quartz was not simply a raw material available for use, but rather it might be sought out for particular reasons. The place that quartz has held in Irish and British prehistory in the spiritual and ritual spheres in terms of artefacts and architecture has been discussed by numerous researchers (e.g. see Bergh 1995; Lynch 1998; O'Brien 1999; Cooney 2002; Darvill 2002). As noted in the previous chapter on quartz in Irish prehistory, the non-utilitarian uses of quartz have played a particularly strong role in interpretations of the archaeological record – with strong links with megalithic structures and medieval burials – so much so that Thompson (2004) argued for an unbroken tradition from the Neolithic to the recent past of the use of quartz as a material reserved for the dead. The example of Thompson’s interpretation highlights the oft-cited dichotomy between the sacred and mundane. A more nuanced account suggests that artefacts and monuments held differing roles and differing significance depending on the context and on the observer or participant (O'Brien 1999, 192): it is not a question of either/or, but rather when, where, and by whom. Using the example from Australia – with ethnographic records to buttress his interpretations – Taçon (1991, 194-8) highlighted how aesthetic and symbolic characteristics of stone, in this example quartz and quartzite, influenced their manufacture and use; he noted that the iridescence and brightness of these materials were of significance because they “are associated with both life and Ancestral Beings” and hence “power-full”. As well as the Australian use of quartz for stone tools and its concurrent symbolic attributes, Eliade (1967b; 1967a; 1971) has discussed the important role that quartz and quartz crystals played in South American and Australian shamanic practices. In some parts of Australia, quartz crystals were seen as having fallen from the “vault of heaven. They are in a sense ‘solidified light’...the quartz is connected with the sky world and with the rainbow” (Eliade 1967a, 177); “[l]et us add that the Rainbow Serpent is an important mythological figure in many parts of Australia, and almost everywhere it is supposed to convey to medicine men their magical powers in the form of [quartz] crystals (Eliade 1967b, 233-4). Quartz played an important part in shamanic initiation rites, where quartz crystals were inserted into the body by swallowing them or going through skin into the body; sacred powerful water that was reputed to be liquefied quartz was also used in these initiations, which caused wings to grow on the initiated – hence related to the sky motif of quartz; in one instance, “Baiame sang a piece [of quartz] into his forehead so that he would be able to see right into things” (Eliade 1967a, 164, 170). "the idea that a distinction between practical and symbolic uses of quartz can be established at different times seems reminiscent of modern attitudes towards the secular and the sacred, each of which are considered to have their time and place, neatly demarcated and held separate from each other. In prehistory, as in many non-Western societies, it seems unlikely to have been so...At the very least we must recognize [sic] that quartz was still being worked at the time of the construction of the cairn, not least to make formal scrapers deposited in and beneath it: this implies that quartz was in use both as a raw material for tool manufacture and as a material used in funerary rituals at the same time" (Warren and Neighbour 2004, 91). The review of quartz-focused research from various regions around the world has highlighted that the difficulties of quartz analysis are not easily resolved. Many of the problems with quartz concern what Callahan (1987) described as the gravel effect – many quartz assemblages on first glance appear to be comprised of amorphous pieces, not easily recognised as humanly modified or forming ‘tools’. Outside of quartz research, the processualist movement in archaeology called for a greater degree of quantification in lithic studies in order to present the research on a more rigorous scientific base (see Lyman and O’Brien 2004). This call led to many researchers moving away from analyses based on formal typological characteristics of lithics, towards examinations of the tools and debitage products’ technological characteristics; these were analysed as part of a technological package in order to develop models of prehistoric societal behaviour. This emphasis on technology as opposed to typology occurred along with an increase of knapping experimentation and the study of fracture mechanics. Even though quartz was the predominant raw material in various parts of the world such studies had not been carried out on quartz assemblages, because quartz was perceived to be an intractable material to analyse; the apparent irregularity to quartz’s fracture pattern made studies such as attribute analysis and reduction sequences inefficient, or futile, in terms of the results. Therefore, quartz assemblages, and quartz regions, lagged behind in such studies. One of the chief difficulties in analysing quartz is caused by the expectations that researchers have of what lithic assemblages should be like – as Knutsson (1998) outlined, it is the conventions of archaeological training that invariably shape ideas of what is expected of the archaeological record. As elsewhere, Scandinavian students learn lithic classifications based on a flintcentric research tradition. Consequently, the Northern Scandinavian lithic industries were perceived as “rough” in comparison to those of Southern Scandinavia and the Continent; “[o]n a subconscious level, this mode of thinking has also been projected onto society as such, which at times has even been apprehended as retarded” (Knutsson 1998, 74). Knutsson outlined how previous Scandinavian research of quartz assemblages which were based on formal types derived from flint assemblages led researchers to equate quartz flake fragments with flint ‘tools’ that had a similar form, therefore bracketing these assemblages into incorrect cultural traditions. Conversely, Gramly (1981) noted that when quartz assemblages appeared to not include certain types of implements, these assemblages would be incorrectly excluded from the geographical distribution of a culture. These issues go to the traditional heart, and life-blood, of archaeological endeavours – that of typology. As noted in chapter 2, the birth of modern archaeological research occurred at a similar time to that of the assertion of evolution as the predominant scientific and social paradigm amongst the classes that formed the bulk of archaeological researchers: this gave rise to the notion of the type fossil, and, as Lucas (2001, 80) has put it, typology was the archaeological equivalent of evolution. With the subsequent rise of the Culture paradigm tool typology thence could define cultures and chronologies, and the rise and fall of tool types were seen as witnesses to the ebb and flow of cultures. The utility and validity of tool typology was, of course, debated over the years, in terms of what the types actually represented and meant to both the original users and, subsequently the archaeologists (see Clarke 1968; Adams and Adams 1991). A significant debate revolved around the Bordes-Binford debate (Bordes and de Sonneville-Bordes 1970; Binford 1973), where tool types were seen by Bordes as signifying differing (cultural) stylistic preferences or by Binford as differing activities or functions. As Tomášková (2005, 82) has noted, this debate did not question the actual types themselves or how they were defined, but rather what these defined types represented. Lithic typologies are for the most part built using the morphological characteristics of artefacts, with differing patterns of retouch an especial characteristic in defining tool types. When defining and naming an artefact type, form and presumed function, were, and are, often used – for example, a ‘disc scraper’ (e.g. Woodman et al. 2006, 159) is defined by its retouch, its convex shape, along with its assumed function of ‘scraping’. In other cases functional and technological criteria are used, such as the burin (for discussion on burins see Tomášková 2005, 83-4). These devised types are often of long standing pedigree, and their use often outlives their analytical utility (Tomášková 2005). Another category used by researchers is that of the formal tool and the expedient tool, as well as the category of ‘utilised flake’ (for discussion on the difficulties with this category see Young and Bamforth 1990) – as mentioned these categories are not always used in the same manner by researchers, and can mean significantly different things to different people; their meaning is not always explicitly stated and must be inferred (hopefully correctly) from the context of use. Quartz lithics in particular often do not lend themselves to formal typological studies because retouch can be difficult to recognise, and often is not even there in the first place. In the lithic studies’ literature there is a general division between typological studies and technological studies (e.g. Minzoni-Deroche 1985; Callahan 1987; Lindgren 1998; Inizan et al. 1999; Andrefsky 2001; Tomášková 2005; Ballin 2008); typological studies are generally geared towards results – the finished artefact; these ‘finished’ artefacts also include core ‘types’ in typologies. Technological studies are not restricted to typing ‘tools’, but concern an entire assemblage, including the ‘waste’ or ‘debitage/debris’ (see Section 5.4), to understand the mode of manufacture. Of course, the technological studies also use the same methods of typing in their analyses, hence technological studies are sometimes described as debitage typological analysis (e.g. Andrefsky 2001), or typotechnological analysis (e.g. Cornelissen 2003; Ballin 2008). Researchers who focus on the technological aspects of lithics are generally critical of ‘pure’ typological studies, because lithic assemblages were dynamic entities and what we analyse are the end points of this dynamism – using morphological characteristics to define types, and hence cultural types, does not take in to account that a certain type may be the result of resharpening or reuse, which may originally have been morphologically similar to a different type; consequently, morphology can only show the last phase of tool type, and not its original ‘type’ (e.g. Flenniken and Raymond 1986; Dibble 1991; Clarkson 2005). As well, while a finished artefact which may appear similar to another finished artefact, the mode of manufacture may have been significantly different or two ‘types’ may have been part of a sequence of manufacture (Knutsson 1988a). In terms of the quartz research, two broad camps can be discerned – those who argue that a separate typology is necessary, and those who maintain that quartz can be analysed in a framework devised for flint. For the latter group, a separate quartz typology would in effect get in the way of an easy and coherent typology of stone tools which can be compared to assemblages of other raw materials or in mixed assemblages, and the emphasis of these researchers is primarily focused on the analysis of ‘tools’, with tools being tools if they conform to attributable types, and especially show evidence of retouch. On the other hand, the researchers that have called for a separate typology for quartz have done so with the recognition that the fracture mechanics of quartz entail that fracture characteristics seen in materials like flint do not necessarily occur on quartz and that the prehistoric users used the differing fracture mechanics to their advantage in selecting pieces for use; therefore a schema devised with the fracture mechanics of the material as the lynchpin is crucial. Only with this in place can different raw materials be compared. While it is indeed the case that quartz can and was used to produce implements that readily fall into formal categories such as arrowheads – especially when high quality, homogenous quartz was used – it also the case that morphologically different artefacts in quartz and flint may have served as the same functional tool to the prehistoric user, as has been argued by Gramly (1981). The extended quote from Ballin cited above (p. 64) shows clearly that he is highly critical of a separate typology for quartz; Ballin wants to be able compare assemblages across raw material types regardless of the fracture mechanics of the raw materials and how these affected the manufacture and use of stone. Ballin sidesteps the issue of the higher fragmentation rate of quartz compared to other materials by not including analyses of complete/fragment properties of quartz except for a few mentions of core fragments. He is explicit on his stance of what a ‘tool’ is, and how to construct typologies: “a quartz artefact is not a tool unless it has the distinctive retouch generally associated with a particular tool type” (Ballin 2008, 40). From this, we can see that Ballin takes the restrictive view of a tool being a tool only if it is retouched, which goes against much work in the last 30 years of lithic analysis (of quartz and non-quartz), especially from use-wear analysis, as well as ethnographic accounts (for examples of unretouched artefacts shown to have been used as tools see examples in Man 1883; White and Thomas 1972; Hayden 1979; Flenniken 1981; Symens 1986; Knutsson 1988a; Odell 1994; Banks 1996; Kozlowski et al. 1996; Read and Russell 1996; Finlayson and McCartney 1998; Briels 2004; Hardy 2004; Setzer 2004; Shott and Sillitoe 2005; Akerman 2006; Hardy et al. 2008). Consequently, his interpretation becomes a vicious circle – if a quartz artefact does not conform to a particular tool type’s retouch, it can be discounted as a tool, and therefore becomes lumped as ‘debitage’. This issue is precisely what the Scandinavian research he disagrees with attempted to prevent: the conforming of quartz to a flint framework of analysis. Knutsson’s analysis of mixed quartz and flint assemblages shows that by examining them from a technological perspective – with a clear picture of the fracture mechanics involved for each type of raw material – they can be compared, and can only be compared directly when the fracture patterns are taken into consideration. What is of interest of course are Ballin’s five points stated above (p. 64) on why quartz assemblages differ from non-quartz assemblages and appear to have less ‘formal’ tools. He notes that quartz fractures differently, implying a need to understand the fracture mechanics of the material, and admits that quartz may have been used without retouch as tools; consequently, according to his own logic, direct comparison with flint assemblages may not be suitable, and, contradicting himself, he does concede that ‘tools’ are not restricted to retouched tool types as devised by archaeologists. Of course, part of this negative attitude by Ballin towards a separate typology stems from the distinction made earlier between a ‘typology’ implying a ‘tool’ typology, and that of a debitage typology; Ballin is more critical of the former than the latter, and needs a similar ‘tool typology’ in order to allow the easy comparative analysis of mixed material assemblages. Commenting on Lindgren’s article cited above (pp. 71-2) Ballin (2008, 40) has argued that “it is, in the author’s view, an illusion that classification of quartz tools (i.e., the recognition of retouch) would become any easier with a different typology”. However, while this is a valid point, it is clearly not the crux of the matter, and definitely not what Lindgren implied. Instead, the differing quartz typology is based on the fracture mechanics of quartz and was developed to understand the resultant debitage products of knapping and to assess the selection of material for use as tools, and not to aid the identification of retouch. Importantly, neither Lindgren nor Knutsson ever suggested that a quartz typology would achieve this ease of retouch recognition. The position taken in this thesis is that certain, highly formalised artefacts may have direct typological comparanda in alternative materials, and that in these instances such relationships should be highlighted. However, it will also be critical to understand those objects in terms of the technical sequences that have led to their formation – and that these sequences may not be comparable across materials; a typology devised for the spectrum of cores and debitage products is called for in order to devise a framework for analysing quartz assemblages, beyond the gleaning for retouched tools. Such an understanding can only be generated through detailed understandings of the properties of varied materials. What is now firmly recognised is that analyses based on formal tool types – tool types defined by archaeologists as ‘formal’ by the recognition of retouch – are only part of the picture of the prehistoric use of lithics; unretouched artefacts were also tools, and a failure to recognise this produces a skewed picture of the archaeological record. Of course, the major dilemma facing the analysis of any assemblage is that the identification of retouched artefacts – the so-called formal ‘tools’ – is the easy part: the difficulty, in terms of time and expense, is setting up programmes of use-wear analysis to identify the unretouched portion of the assemblage as having been used as tools, and not bracketing them off as ‘debitage’ or ‘waste’. Unfortunately, it is beyond the scope of this thesis to conduct use-wear analysis on the assemblages under scrutiny as this would be a full PhD project in its own right; consequently, this thesis should be regarded as the first step in the understanding of quartz technology in prehistoric Ireland, and this is to be achieved by a series of knapping experiments to assess the fracture mechanics of the quartz, in order to set up a framework for understanding the assemblages from the point of view of the procurement and manufacture of the artefacts. It is hoped that this research will then allow a suitable framework for use-wear analysis to follow on from it. An important aspect discussed by various researchers is that ‘quartz’ as a general term for stone, or more correctly, mineral, is a catch-all term that masks considerable diversity in quartz-types used; a number of researchers cited pointed out that the best quality quartz was actively sought out and used, while some have analysed the procurement of differing quartz types for different tool types in terms of the Binfordian concept of expedient and curated tool kits (e.g. Ballin 2008; Abbott et al. Forthcoming). As noted, quartz is very often linked with a bipolar technique of reduction (cf. Rankama et al. 2006, 250), but this review has shown that the reliance on this technique by quartz users has been over-emphasised by researchers, and indeed, Knutsson’s experimental work suggested that a platform core can also produce what appears to be bipolar flakes, therefore adding to the complexity of analysis. But it is clear that the use of a bipolar technique was certainly not a necessity but came down to traditions of working and choices by the knappers, rather than material constraints. Another aspect is that while the use of quartz has often been interpreted as a necessity, this review has shown that this was not the case in all instances, and quartz was actively chosen, even when valid alternatives were available. Therefore, quartz can be seen as a valid raw material and ideas of it as a poor substitute reflect the paucity of our knowledge of prehistoric peoples rather than a prehistoric reality. What is discussed less frequently is that this ‘validity’ of quartz as a raw material may well have roots beyond the immediacy of the raw material as analysed by modern technologists, but rather, the use of quartz was bound to the social, cosmological, and spiritual realities of the prehistoric communities and how they comprehended quartz and its place in the world. For much of the research presented, this aspect is usually considered secondarily, if at all, to the ‘hard facts’ of technology; a modern take on technology that is conceived and interpreted as fundamentally asocial in its conception and practice, and splits the social reality of technological practice for the seemingly more fundamental aspects, or questions, of technology – those which concern purely material and functional attributes (for discussions on the sociality of technology see Pfaffenberger 1988; Lemonnier 1993; Reynolds 1993; Dobres 2000; Ingold 2000). Ingold (2000, 314) has argued that there was no such thing as technology in prehistory, by which he means that the modern concept of technology – as a sphere of activity separated from social relations, and as a means of mastery over, and distance from, nature – did not exist until relatively recently. Instead, Ingold (2000) emphasises skilled practice and the embeddedness of sociality in technology; he argues that the study of material culture should be based on artifice rather than artefacts, which emphasises technology as action. Similarly to Ingold, Dobres (2000, 1, 128, passim) maintains that people do not possess a technology but rather people enact technologies, and she places emphasis on practice and on the group – she calls these “mindful communities of practice”. Dobres argues that even seemingly ‘simple’ technologies were inherently political and consequently open for contestation and ambiguity, and that these were played out through technological practice. Reynolds (1993) describes the separation of the technical from the social as the “great tool-use fallacy”. In deconstructing this fallacy, he highlights the cooperative construction of artefacts and complementary action undertaken to bring this about. Reynolds (1993, 410-2) argues that even when people work alone, this is still social because the skills used are developed as a member of a group; it is usually just one action in a larger, community effort; required raw materials obtained through social exchange; and “because it is typically direct towards social ends”. Rankama et al. (2006) broached the question of how the analysis of a seemingly simple technology utilising quartz can be analysed in terms of what they consider the social dimensions of the technology, as has become more commonplace in the analysis of flint. They suggest that avenues taken by lithic analysts such as the study of learning processes, the transmission of skills, identifying skill levels, and issues regarding power and prestige are ill-suited for quartz studies and that it is “essential that the methods employed in these [quartz] studies are not selected on the basis of their popularity in current lithic research but purely on the basis of the applicability to the specific characteristics of vein quartz assemblages” (Rankama et al. 2006, 261). They suggest that investigations into the chaîne opératoires of quartz assemblages can provide an avenue into the social implications of quartz technology, by focusing attention on the choices taken in the reduction and use of the lithics. This thesis maintains that technology is ineluctably social in its formulation, application, and implication. Consequently, the sociality of technology is not something that happens after the fact; a draping of attributes on to technological studies, or a check list of evidence which can point out the social side of technological practice, but at the heart of what technology was and did. This acknowledgement of the sociality of technology does not of course ignore the fundamental materiality of technology: the working of stone could not but be a physical act, but this does not detract from the premise that this physical act was played out in a social arena in which the actions and consequences of practice formed and maintained social relations – relations not only between people, but also between people and the plants, animals, and what we perceive as ‘inanimate’ parts of the world; it is only one perspective to view sociality as limited to humans (see Ingold 2000). Indeed, the concept of materiality has been used as a way to conceive of the mutually reinforcing place of the social and material world (see Gosden 1994; Jones 2004a) – the material world’s properties both enable and constrain human action (Gosden 1994, 77). The fundamental issue with archaeological concerns is that change happens – attitudes change as relationships change, and the aim of archaeological practice is to be able to point out changes in material culture and interpret what these changes meant for the communities involved. Consequently, while the reality of the sociality of technology can be expounded, the challenge is in interpreting how this evidences itself in the archaeological record, and how changes in material culture can be tied to changes in the relationships between people and the world in which they dwelled. Bisson (1990, 120) mentions in one line that flaking experiments were conducted on the raw material, but does not elaborate on the results, beyond that it showed that the quartz “has a large number of cracks and other flaws”.[return]. For a discussion on the varying meanings of 'debitage' and 'debris' see Section 5.4.[return]. The small size of these tools should be noted, in relation to a later discussion in Chapter 5, where the terminology for artefacts under 10 mm in length will be discussed.[return]. The experiments were also conducted on a range of other materials, but only quartz will be discussed here. [return].